This ensemble meets on specific dates only (see below). 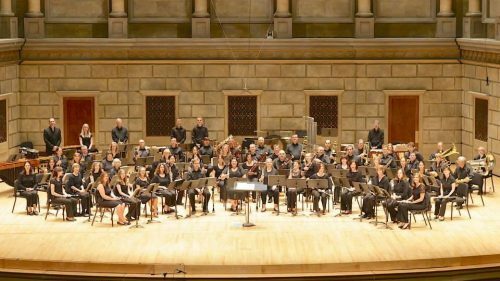 This concert band is comprised of Rochester area music educators and related professionals, and performs both traditional and contemporary wind band literature. The ensemble meets each summer for 6 weeks and performs at Eastman’s Kodak Hall in early August. There are usually 3 concerts during the school year hosted by area schools, and each concert is preceded with 3 or 4 rehearsals. The ensemble has been invited in the past to perform at the NYSSMA Conference and has been guest conducted by Dr. Paul Shewan, Tom Davis, Matt Osika, Bill Palange, and Dr. Mark Scatterday. Guest artists have also appeared with the ensemble, including composers Lindsay Bronnenkant, Russell Scarbrough, Matt Osika, and Bill Palange. Rehearsals are in Messinger Hall on the Eastman campus. Members commit to as many “seasons” as their schedule allows. Instrumentation may be limited due to the size of sections and repertoire. Bill Tiberio, concert and jazz band instructor at Fairport High School, University of Rochester, Ithaca College, and SUNY Geneseo directs the ensemble. Educators and related professionals interested in performing in this ensemble should contact Bill directly at wtiberio@gmail.com. If you are not a current music educator, please consult with Bill directly before registering. Click here for recordings from the Music Educators’ Wind Ensemble.